From November 12 to November 18, a robotic business mission took place in South Korea with the participation of the National Association of Robotics Market Participants (NARMP). The meeting included the exhibition of modern technological trends ROBEX and the Daegu Global Robot forum. Delegations from 15 countries visited Maxon Motor, Korea Institute for Robot Industry Advancement, and also saw the cultural sights of Seoul, Daegu and Gyeongju. Aurora Robotics joined the Russian delegation and presented its developments at the business forum Daegu Global Robot, in which 7 countries participated — the USA, France, China, South Korea, Russia, Malaysia, Taiwan. The main theme of the forum is the creation of a global robotic cluster. The cluster is created to respond to the challenges of the development of robotics, for fruitful cooperation at the regional and global levels. 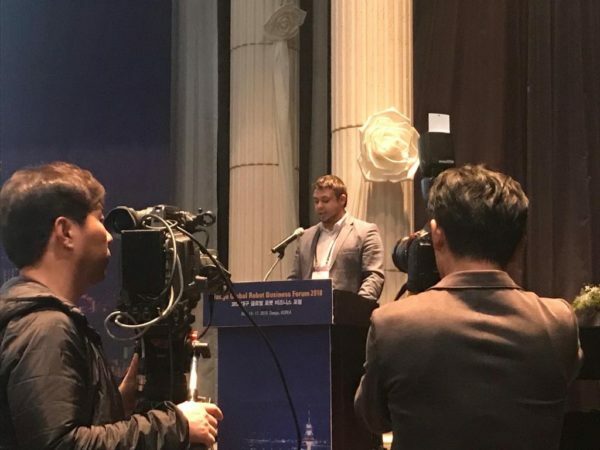 Daegu Global Robot Forum aims to create new enterprises through periodically held international events that contribute to the development of the robot industry and new platforms in the field of robotics. For NARMP, the trip last year was marked by strengthening ties with the United States, France and China. Studying the experience of cooperation between the state and this industry will help NARMP in creating the Russian Center for the Development of Robotics.